We can see the randomness of inheritance in this table. And we see a surprise (that I just discovered today with this exercise!) that reminds of the fact that matching DNA can come from BOTH parents! 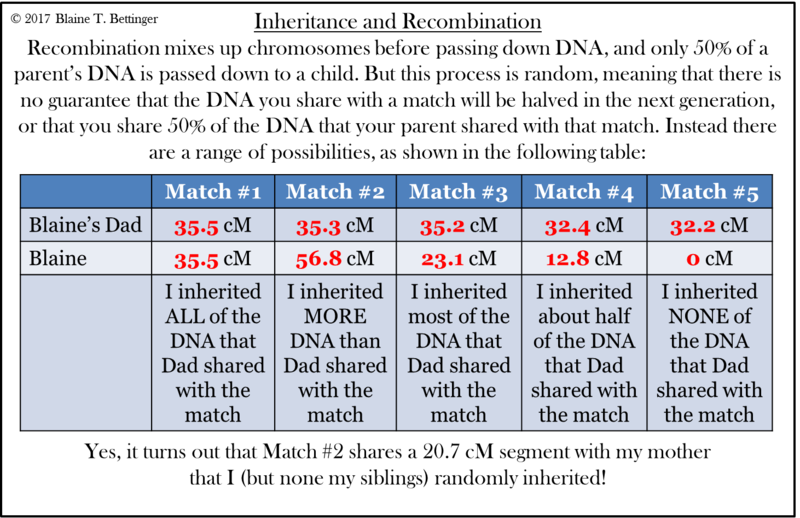 And if you’re interested in even more detail, here’s how my siblings inherited DNA from these same matches. I have a brother who is homeless. He has been a crack cocaine addict for years. Would his DNA test be altered because of his drug abuse? Hi Cindy. I’m so sorry to hear about your brother. It is unlikely that the DNA collected by these tests is going to be affected by drug abuse, but I don’t know if anyone has done any such study. That is really interesting! I always thought that every child would have a lot more that just 50% from a parent. I have been looking for my father’s birth parents and decided to do DNA testing from 3 different places. I have a half brother, and I just knew that I could find my father’s birth father, but I think the DNA results have really confused me. A lot of what I see in his DNA are his mothers side and the birth grandmothers side. I thought it was suppose to give me the male side. Why am I finding the maternal side? An autosomal DNA test will share information about both sides of a family. However, if one side has tested more, or if that side comes from a region of the world that is more likely to test, you’ll see more matches to that side. I see this wide variance with my Grandma, my mom, and her 3 half siblings a lot with dna matches from my grandma’s side. It’s really neat to see how the segments are passed down differently to each sibling.